We do our best to ensure the safety of our volunteers. Street Angels patrol in groups of at least three, always including at least one man and one woman. Each patrol has a link radio which links us to the CCTV operator, security/ venue staff and the Safe Haven bus. We have had very few incidents in which Street Angels have felt threatened. Usually we are in far more ‘danger’ of being hugged and thanked than attacked! 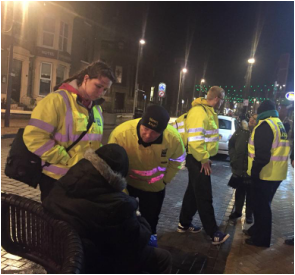 No – as long as you can walk around the night-time area of Blackpool you can patrol with us. Although we reckon we can walk up to 5 miles a night. You can be on a team based at the Street Angels minibus if walking isn't for you! Warm, comfortable clothes – and, in winter, a hat and gloves. In very wet weather please do not wear jeans as they soak up water when it rains and you would be very cold and uncomfortable. Waterproof trousers can be helpful when it rains. We provide warm, waterproof hi-viz jackets in various sizes. Street Angel beanie hats or baseball caps are also provided. Warm clothes (see above). Something to eat – or money to buy a take-away in one of the many shops near the base. We provide hot drinks and biscuits. We patrol from our minibus opposite Soul Suite at Queen's Square. 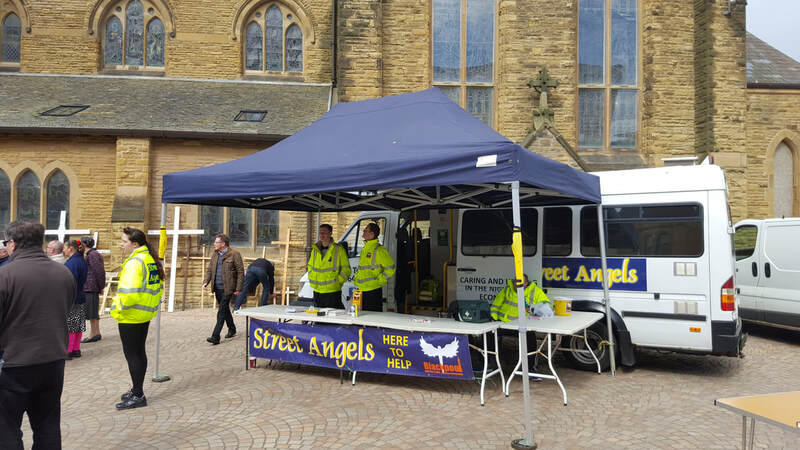 We also have a base at St John's Church, Cedar Square entrance from 9pm where Street Angel volunteers can park. We will try and make sure all volunteers get home safely. By prior arrangement when possible we will reimburse some expenses.